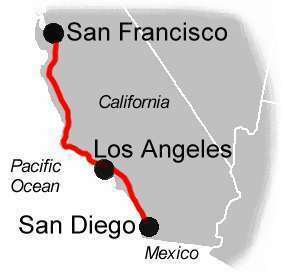 Route - 'California Coast', southbound | America's Trains Inc. In addition to enjoyable activities at San Diego, Los Angeles and San Francisco, travel en-route along the glistening California coast, past the trestle surfing beach, through vintage Northern California scenery, between the Santa Cruz mountains, through green garlic fields, the abandoned ghost town of Drawbridge, the rolling green Pajaro Gap and Soledad in Steinbeck country where Of Mice and Men was set. Cut through green vineyards and around horseshoe curves allowing you to see the whole train at once. Enjoy breathtaking views of southern California’s coastline. Stations are also interesting; brief stops provide time to view Santa Barbara’s Spanish Colonial architecture, Los Angles Union station’s marvelous collision of Spanish Colonial and Art Deco, and Anaheim’s glinting metal and provocative curves in contrast with San Juan Capistrano’s mission architecture. Click on Comparable Train Vacations for fare comparisons. Provisional reservation: A specific Journey can be held by making a provisional reservation, at no cost and with no obligation, at any time before 175 days prior to the departure date. However, if at any time another firm request for the same Journey occurs, a normal confirmed reservation deposit is required to hold the provisional reservation, payable within five days after being given a related notice by confirmed email, mail, mobile phone text or telephone. Otherwise, the provisional reservation can be cancelled. Confirmed reservation deposit: $50 per person more than 175 days before the departure date to guarantee a provisional reservation; increasing to $100 per person 175 days before departure; increasing to $250 per person 133 days before departure; increasing to full payment 91 days before departure. All deposits are refundable as described below. Refunds: A full refund of all amounts paid is made to passengers that cancel a confirmed reservation more than 91 days before a departure date; thereafter, the refund is equal to all amounts paid less 1% of such amounts for each day under 91 until and including the 14th day before the departure date; thereafter no refund is paid or owed. The date of a cancellation is the date that the respective Rez Center receives notice of such cancellation by confirmed email or regular mail. Deposits and full payments are held until the respective Journey departure date, as required to specifically provide for all respective Journey by Rail expenses, or potential refunds. Reservations, payment, refunds, use of Cars and availability of Journeys by Rail are governed by Terms and Conditions.